April 30, 2018 - PRLog -- Human milk saves the lives of medically fragile infants every day. Yet, millions of parents are still being prevented from achieving their personal infant feeding goals, from donating or accessing human milk, and from obtaining positive, ethical and evidence-based information about all healthy infant feeding methods, including breastfeeding, donor milk, and infant formula. 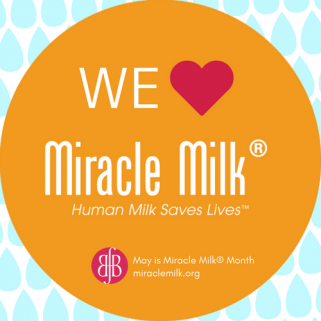 Accordingly, Best for Babes and leading maternal and infant health organizations are declaring May is Miracle Milk® Month— Human Milk Saves Lives & YOU are the Miracle, Babe! Everyone that cares about the health of mothers, babies, families and the planet is invited to cheer on, coach, and celebrate ALL parents and caregivers without judgment, pressure and guilt through this month-long Campaign. Celebrants can register their powerful voices, show their support on social media, and share critical, trusted information on healthy infant feeding with parents and providers. The Campaign's Digital Toolkit includes an educational info-meme series at facebook/bestforbabes, social media badges, and the printable "Ultimate Healthy Infant Feeding Guide" and "Fast Facts about Miracle Milk." These essential resources can be delivered to doctor's offices, hospitals, maternity/baby stores, airports, malls and support groups. To date, 1000 Days, KellyMom (https://kellymom.com/), USBC (https://usbreastfeeding.org/), LLLUSA (https://www.lllusa.org/), Breastfeeding ROSE (http://www.breastfeedingrose.org/), BMBFA (http://blackmothersbreastfeeding.org/), HMBANA (https://www.hmbana.org/), and Human Milk 4 Human Babies (http://hm4hb.net/) have joined the campaign, and more are expected to come on board! Building on the success of the 2014 - 2017 Miracle Milk Stroll (led by volunteers in 165 locations across North America, the U.K., and Japan) and designed to complement World Breastfeeding Week (http://worldbreastfeedingweek.org/) and National Breastfeeding Month (http://www.usbreastfeeding.org/nbm), the Miracle Milk® Month (http://www.miraclemilk.org/) Campaign is a powerful, positive-pressure countermeasure to "parent shaming" and the backlash against breastfeeding movement​ which detract people from the real issue at hand: human milk saves lives, and millions of parents are still being undermined by the baby- and Breastfeeding Booby Traps® (http://www.bestforbabes.org/what-are-the-booby-traps). The Campaign's mission is to increase access to Miracle Milk for ALL parents and caregivers by inspiring a culture-wide appreciation of human milk and its life-saving power in the NICU and every day. It positions healthy infant feeding as a cause during a peak time of year in proximity to Mother's Day. Finally, the Campaign also raises awareness about the urgent need to protect parents from predatory marketing which undermines parent's informed feeding decisions. Following the World Breastfeeding Week model, celebrants of the MMMC are free to design local events and gatherings, if they so choose. However, Best for Babes will provide no oversight, sponsors, or swag for any gathering, activity, or event. The Miracle Milk® Month Campaign has the power to expedite a sea change in the way America protects expecting and new parents, and increases access to the precious Miracle Milk® only humans can make. Since 2007, Best for Babes has led the charge to ensure that all expecting and new parents and the 360 degree world around them get positive, accepting, evidence-based, ethical and non-judgmental information and support, regardless of their feeding decisions. Best for Babes harnesses the power of moms, celebrities, companies, advertising, the media and the medical community to pressure on the barriers, not parents.